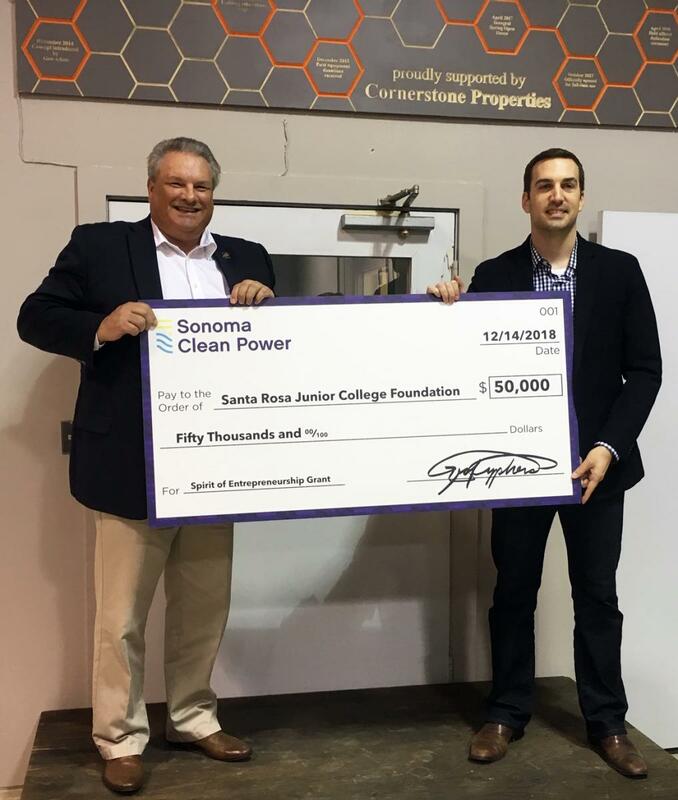 February 1, 2019, Santa Rosa—Sonoma Clean Power (SCP) is pleased to announce the launch of the SCP Spirit of Entrepreneurship grant with a gift of $50,000 to support Santa Rosa Junior College entrepreneurship program students who incorporate sustainable practices into their small business plans. The gift will fund annual awards to SRJC entrepreneurship students who include sustainable practices such as reducing energy consumption, improving air quality, reducing fossil fuel consumption, expanding the use of renewable energy, promoting eco-friendly transit, conserving water & resources utilizing environmentally sensitive building materials. This generous gift has been recognized as part of the SRJC 100th Anniversary Campaign. Bill Comings, SRJC Business Faculty and Entrepreneurship Program Coordinator, said that his department is very excited and appreciative of SCP’s gift. Nathan Kinsey, Commercial Accounts Manager at SCP, said that the SCP Spirit of Entrepreneurship Grant is intended to develop sustainable entrepreneurs invested in establishing a strong culture of environmental stewardship, economic vitality, and social equity throughout the region. Sonoma Clean Power is proud to serve the counties of Sonoma and Mendocino, as the self-funded, public electricity provider. At SCP, we’re invested in the communities we live and work in. We deliver services that enhance quality of life through competitive pricing, improved air quality, and energy efficiency. By changing the way resident’s source energy, we’re able to deliver customer programs that make a difference in everyone’s life.